WINNERS: Of Hank book of choice: Cate Noble. Of Sandra Parshall's book: Flora Church. Of LynDee Walker's: Kathy Reel. Of Jim Jackson's: Hallie Ephron. (Jim is choosing another winner, too..!) Please contact Hank with your snail mail address! Needless to say, we could never replicate that cake. And I know she would be happy to hear that. The fabulously talented Hilary Davison had a cool grandmother, too. If you know me at all, you know that my grandmother had a tremendous influence on me. Her name was Maude — though I called her Nannie — and I’m proud to say she was quite the dame. With her red lipstick and perfectly waved black hair, her sharp suits and high heels, she could’ve been cast in one of the classic Hollywood noir films she loved so much. I dedicated my latest book, Blood Always Tells, to her. It reads, “In loving memory of my grandmother, Maude Elizabeth Dallas, for teaching me that if you’re going to sin, sin big.” It’s a joke that she would’ve appreciated. She loved saying, “If you’re going to sin, sin big,” which was one of the reasons she seemed so unlike other people’s grandmothers to me (there was also her love of pro wrestling). The stereotypical grandmother is supposed to be sweet. Mine was hot-tempered, affectionate, loyal, and uproariously funny. Sweet, not so much. Nannie had a saying for every occasion. Her words regularly pop into my mind, along with her voice, which never lost its crisp Northern Irish accent. They were never intended as advice about writing, but I’ve adopted some of them along the way for that very purpose. Maybe it’s no surprise that a dame who adored the films of Barbara Stanwyck and Tyrone Power could dole out advice on writing with more than a hint of noir. But these are some of the things I’ve learned from her. I remember being puzzled by this saying for a long time, until one day, I caught myself doing something that had annoyed me when another person had done it. “But this is an exception!” my brain insisted. “This is different.” But I knew that it wasn’t, and that my brain was using fuzzy logic and making a pretzel of itself to insist on the difference. It’s one of the reasons I find people so fascinating. We carry these contradictions around inside, and they ring true if we don’t examine them too closely. When Nannie said this, she was usually cutting self-important people down to size. She didn’t have much regard for people who considered themselves indispensible, because the world, sooner or later, would dispense with them. It was also tinged with a bit of memento mori, though. There’s a warning embedded in it to never think you’re indispensible yourself. Unlike, say, George R.R. Martin, I’m one of those writers who finds it hard to kill a character. It’s not that I’m opposed to the idea, in theory. Many of my plots are built around a murder, so I know I’ll be killing someone along the line, and I’m fine with that. But theory is different from practice. After I’ve spent time writing a character and really getting under their skin, it’s painful to imagine killing them. My brain will contort itself, puzzling out how to keep that character alive. I’ve had sleepless nights over the issue. But I’m always guided, in the end, by my grandmother’s words. Of all Nannie’s sayings, this is the one I struggle with the most. The idea behind it is that heredity is destiny, and that your genes may well be rooting against you. I agree with that to a point — and scientifically, I know there’s some truth in it — but I believe that it’s possible to overcome a genetic inheritance. Blood Always Tells is filled with this tension of nature versus nurture partly because this question fascinates me so. After all, if all a human being can be is the sum of their genes, how can you hold people responsible for what they do? I’m interested in exploring how people try to change their fates, and how they find the strength to go on when they know the deck is stacked against them. It’s something I think my grandmother herself managed to do when she crossed an ocean and came to Canada looking for a better life for her family. Hilary Davidson’s life of crime started with Thuglit, which published her first three short stories. In 2011, she won Anthony Award for Best First Novel for THE DAMAGE DONE, the novel that launched the Lily Moore series, which also includes THE NEXT ONE TO FALL and EVIL IN ALL ITS DISGUISES. Hilary’s work has also won two Ellery Queen Readers Choice Awards, a Crimespree Award, and a Spinetingler Award, and she's been a Derringer Award finalist. Her fourth novel — and first standalone thriller — BLOOD ALWAYS TELLS, was published by Tor/Forge on April 15, 2014. According to reviewer Oline Cogdill, it's "a heartfelt, energetic story about greed, entitlement and the unbreakable bonds between siblings who never stop believing in each other." Dominique Monaghan just wanted to get even with her two-timing, married boyfriend, a washed-up boxer stuck in a toxic marriage to a dangerously spoiled socialite. However, an elaborate blackmail scheme soon lands her in the middle of an unexpected kidnapping... and attempted murder. But who is actually out to kill whom? 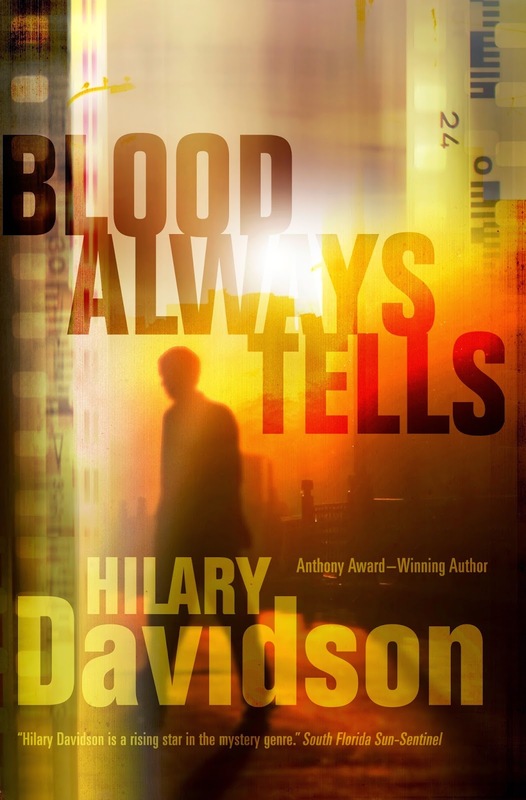 Hilary Davidson's Blood Always Tells is a twisted tale of love, crime, and family gone wrong, by the multiple award–winning author of The Damage Done and Evil in All Its Disguises. My grandmother taught us by example . . . we learned to take pride in the things we did, to have respect for others, and to do the right thing, even when it was hard. Grandmothers are a special gift . . . . I love those sayings. Like you, I had to puzzle over a few of them, but I as I read your thoughts, I think you nailed them. BTW, I'm wondering if the one about "What is in the bones comes out in the flesh" isn't about genetics but about who you are eventually coming out no matter how much you try to hide it from others and even yourself. I think I've mentioned Auntie-Mom here once or twice. She is a character, but Auntie-Mom's mother was Auntie-Mom and twice again as much. When I was starting to think about birth control, I was sitting with my grandmother at her kitchen table in Boston. We were having tea, and I tried to be very casual about it, so I thought out loud why the church taught that taking the pill was a sin. My grandmother took a big slurp of tea and said it was funny, because she had asked the priest the very same question once when she went to confession. Only there wasn't a pill then. They just had condoms that weren't perfect but were better than "the rhythm method." I took a big slurp of tea and asked her what the priest said. She smiled and told me he said, "Oh for heaven's sake, Claire. You're not confessing that are you? Tell me something good, because I have real sinners waiting in line to talk to me." So that's where Auntie-Mom gets her spirit. Think for yourself, could be the Harrington family motto. They both passed it on to me. Wow, Hank, your grandmother and mine might have come from different planets-- except for that recipe. My grandmother cooked the same way-- I call it "cooking by ear," the same way everyone on my father's side of the family plays the piano. It's all done by instinct. Employing that instinct, I managed to duplicate one of her recipes, the one for cinnamon-dusted, hard flat cookies that exist to be dunked. But while I often make those "logs," the "rocks"-- the cookies that made my friends line up outside my dorm room door whenever one of her large boxes of them would arrive-- have eluded me for forty years, and not for want of trying. Those cookies were huge, and mounded high, and chock full of raisins, nuts and chocolate chips. She covered them with a chocolate glaze that I haven't the vaguest notion of how to duplicate. As for what she was like, the one thing I will say is that she was tough without seeming to be, resilient in the face of many blows without ever being mean. I probably survived my teens only because she was my refuge. I miss her a lot. Hilary, wonderful post. Your grandmother was a treasure--she would be so proud of you. Hilary, your grandmother sounds like a pip. My grandmother could be hard as iron ore and soft as a merino blanket. Look at the big picture, Gram used to say. When I was ten or so, our family went to our grandparents farm above Conesus Lake, NY for July 4th and I took ill. Everyone else went down to the lake to view the fireworks from the local platform in the lake. Gram never had joined us for those trips so naturally, she stayed with me. Once they were out of the house she hustled me up to her room, sat me next to the West window, and bundled me in a quilt. It turned out that from that bedroom we could not see any of the low fireworks. What we could see were the high, fill-the-sky-with-color ones -- and not from just the one station we normally watched, but from all four places along the lake where they shot off fireworks. And the booms rattled the windows. And I vividly saw the big picture. What a very cool Nannie you had. And a very cool Minnie our Hank had. Oh, the lessons we learn from the women in our lives - they are many. I've been told I get my "Norma Rae" characteristics from my paternal grandmother who I dearly, dearly loved. The woman told it like it was. One of the things I learned through my grandmother was that sweet people can have a sour edge. Welcome to Jungle Red, Hilary! I did not have a glamorous grandma. No marcelled curls. She had a lot of bosom (the one thing I did NOT get from her) and smelled like Crisco. Weird. But she did make fantastic thin cinnamon-sugar-sprinkled cookies that I have NEVER found a recipe for. So if anyone has a recipe for **thin crispy** cinnamon cookies, please please, I'm waiting!! My mom's mother encouraged us to be creative by making available to us crayons, coloring books, drawing paper, water color paints, clay, building blocks, some other building toys that were the precursors to Legos, books and magazines geared towards kids. She taught us about loving each person as an individual. She was never without a smile, and often hugged us. Each grandchild (and there were 20 of us) KNEW that "I am the favorite". My dad's mother came across as a rigid, unfeeling person. I now know that she was the victim of domestic abuse and learned to not show her emotions, because to express feelings could be dangerous for her. I found it difficult to be around her. What I did get from her was a love of baking. Everything she baked was bakery-quality. I especially miss her cookies that melted in your mouth. I'm sorry I didn't get to know her better. (Both of my grandmothers died about six weeks apart when I was in college.) Until recently, I didn't know that she often took my two youngest aunts into New York to go to the theater. I never would have guessed that she had any interest in that. SO funny that HIlary's post comes this weekend..my two grandchildren are here wand we are playing now--"rescue the lizard" when Josh's sticky plastic lizards went behind the couch and I had to rescue them with a "lizard extractor" (tongs.) The tongs became a microphone when Josh "interviewed" me afterwards. Eli is learning to play the saxophone, and is now attempting Dayenu. But I am very conscious about what they are learning from me. "Don't drop your lizards behind the couch" does not seem like a lasting lesson. Oh, to have had a grandmother. Both sets of grandparents were already gone when I was born, and I've always lamented the fact that I didn't have that relationship. It's one of the reasons I've encouraged closeness with my kids and their grandparents, and why I try to be a fun one for my grandkids. Hilary, I think I fall more into the category of your grandmother, on the colorful side. My daughter seems to caution me every so often. Hank, your mother was such a beautiful woman, and I can see from whence your beauty comes. And, how sweet of you to include the recipe. Hilary, how lucky you were to grow up with such an interesting grandmother. The words of wisdom you've shared are delightful. Your book sounds fantastic and so I add yet another one to my TBR pile. Thanks for the fun post today! Great post. I never thought about it before, but I now I think my grandmother taught me more than I realized: it's never too late to learn something new and no one has to teach it to you. She had to quit school after 8th grade, got married at 15 and had to raise the siblings her own mother sent to her. But she was still the smartest woman I have ever known. Hank, her recipes looked like your grandmother's. We'll never make that chocolate sauce right but I learned how to make a meal out of anything. And reading - she taught me my love of reading. Anything at her house was at my disposal without limits - all the books she was reading, all the magazines, and of course the encyclopedias. My grandmother taught me that women don't have to have a significant other to be strong and complete, that as long as you're content with who you are, you'll be fine. I come from a long line of independent women, and I'm always grateful. My husband didn't have but one grandmother alive when he was a kid. She spoke German, and died before he could really get to know her. I feel sorry for him because I not only had both grandmothers, my wonderful maternal great grandmother lived until my late teens, and we got to spend a lot of time with her. But I don't remember much about what any of them said, per se. My paternal grandmother was a pistol, and not necessarily in a good way. She and Grandpa, both very German, drank a gallon of draft beer a day. Grandpa would walk to the beer garden with his empty jug every morning. They kept aluminum tumblers in their tiny freezer to drink it from, and we were also given RC Cola in those tumblers. Grandma was a Presbyterian church lady, but she was the biggest hypocrite I ever knew, always gossiping and criticizing everyone else, while she guzzled her beer with her stockings rolled down below her knees. She kept a sharp watch on the neighbors, just in case, you know. She was something. My maternal grandmother, and my great grandmother, were both very loving and shared themselves with the family. We were just talking last night how much like Grandma I am in that she would stay up late every night reading. My great grandmother was quite the seamstress, and I get that from her. I hope I got the "embrace family" gene from them, as well. Oh, dear . . . here's hoping for a speedy recovery! My grandmother was also named Minnie. There endeth any similarities, though. My grandmother couldn't cook worth a damn. She wasn't cool or funny or...nice. She was a dark-hearted, nasty, self-absorbed person. Despite herself, though, she taught me an important lesson: try to be as little like her as possible. What a great topic. I just got off the phone with my aunt, who lives in the house my grandparents lived in for 60 years. Grandma is alive and in her 90s, but in a care facility because of dementia. Grandma just called her "sister"--really my aunt--asking her pick Grandma up at the train station before her parents figured out that she snuck off to New York City to see Frank Sinatra perform. I guess if you are going to lose your current memories, sneaking off to see Frank Sinatra is a good one to keep. Grandma was great when I was young. While she never let me win at games, she also was always willing to play, and she taught me that more often than not, it is better to speak honestly than stay silent. Even though she's still here, I do miss her. My thanks so much to everyone who's stopped by with a story! I loved seeing Hank's grandma Minnie, and I love hearing about all the wonderful grans out there. My mother always says that Nannie would've loved to see the way she's been remembered. She was a wonderful person to have in your corner. She passed away in 1999 and I still miss her every day. Hank, I hope Jonathan is okay! Easter at the ER does not sound like fun. Martha, that is so dear.....and heartbreaking. (My mother used to talk abut sneaking off to see Frank SInatra!) She never let you win, huh? I can;t decide about that, you know? When I play with Josh and ELi, I'm always wondering if I should let them win. We often play games, though where it's mostly luck. Like war. HI, Erin--that is a GREAT story..and a good lesson--there are many ways we can learn. xoox And, thank yo so much--Jonathan is fine...fine-ish. He has a sprained ankle--which is incredibly annoying,He has crutches..
War was exactly the game I was thinking of, Hank. For me, Compare doesn't have the same ferocious spirit, but I suppose that's the point. Glad to hear your grandson is home. I hope he finds the crutches an adventure, at least until his ankle is better. One life regret: not asking her about her experience as a telephone girl before she and Grandpa were married. She was the operator for the town I grew up in, in the early 1920's, and she memorized every single phone number. Granted, there were probably no more than a few hundred, but that's still a lot. And to her dying day she had the sweetest phone voice. Hank— "... they don't call it WAR anymore? They call it Compare." What! Are you serious? Who started that? I always thought that since War was a card game that depended almost entirely on luck, there was a great metaphoric lesson in there somewhere. Grandma loved cooking (and had mysterious recipes filled with a pinch of this and "just enough" of that), and LOVED children . . . she was no-nonsense, expected to be minded, but so full of love that no one wanted to misbehave. (She did have some fun stories about my father's misadventures when he was young, so maybe that perfect discipline took time to develop). The nature/nurture question is intriguing. Friends who adopted many hurt little children would soundly favor nurture, and their children were wonderful. Early telephone operators made history and helped win wars. My storytelling friend Ellouise Schoettler has a new program on their history. Unfortunately, I didn't have much of a chance to learn a lot from my grandmothers as the both died. When I was too young to appreciate them. I did learn most of what makes up my moral character from my aunt. It's her voice I hear.most often guiding me in tough situations or life in general.